The shrimp-scallop dumplings uphold the promise of artistic food. 2123 Franklin St., Oakland 818-585-9152 Hours: Fri.-Sat., seatings at 6 p.m. and 8:30 p.m.
Three shrimp-scallop dumplings sat on my plate like tropical islands, surrounded by a serene ocean of blue dashi. It was a fitting second course for Abstract Table's current seven-course dinner series, Atolls, which centers around the theme of islands both in its visual presentation and choice of ingredients. Abstract Table's attention to presentation is only natural considering that the Japanese and Scandinavian-influenced permanent dinner pop-up was founded by chefs Andrew Greene and Duncan Kwitkor, who actually received their formal training in the visual arts — painting, to be precise — rather than the culinary arts. 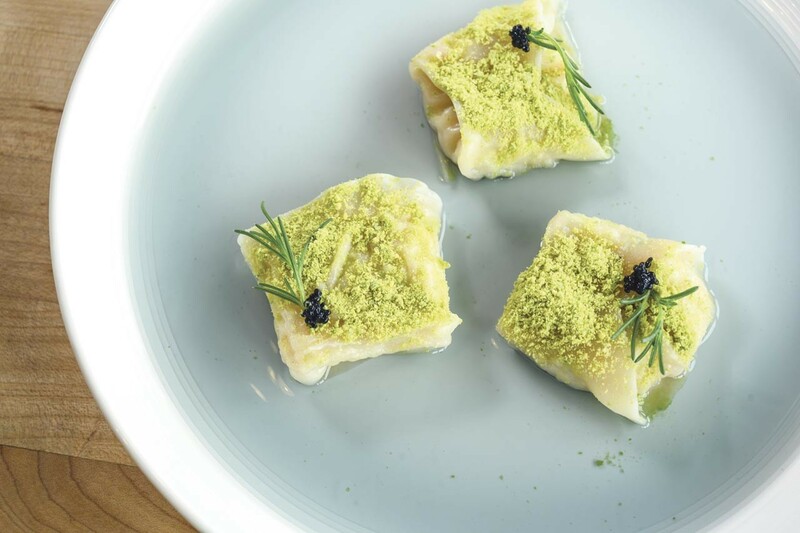 With courses like the shrimp-scallop dumplings, Abstract Table upholds the promise of an artistically plated and thematically unified tasting menu. But does it deliver on presentation and execution throughout the meal? And most importantly, is it worth it? Abstract Table consists of Greene and Kwitkor, along with chef Dennis Imazumi and pastry chef Melanie Cates. The chefs create five- and seven-course themed tasting menus, which change every few months and are affordable as far as tasting menus go. When I visited, it took 2½ hours to finish all seven courses, and the courses came out a bit too slowly in the beginning. The ambience is industrial-chic, at best — after all, you're in a space that serves as a fast-casual restaurant by day, complete with hard metal chairs and Mason jars for your wine. The knowledgeable service, along with paintings from San Francisco artist Peter Warren that were specifically commissioned for each tasting menu, added a little upscale flair to the experience. The current Atolls menu was inspired by Greene and Kwitkor's love for the ocean, with a nod toward issues of sustainability. The chefs are also mindful about sourcing. Though it's not written on the menu, they use sustainable seafood and local ingredients when possible. The first course was a Hog Island oyster served on lava rocks atop a wooden board, with diced raw scallops and mango in a citrus marinade reminiscent of ceviche. Topped with a confetti-like assortment of spirally green leeks, charred orange habanero peppers, and edible purple flowers, it was like a visual invitation to get the dinner party started. But the marinade lacked the citrusy zing necessary to wake up the flavors of the ingredients. The three shrimp-scallop dumpling "islands" each came topped with avocado powder and kelp "caviar," which added visual interest as well as a chance for the chefs to show off molecular gastronomy techniques. The dish cleverly tied into the island theme, particularly with the dashi dyed blue by steeping it with butterfly pea flowers. The dumplings highlighted the natural sweetness of the shrimp, while the kelp caviar had the same satisfying pop as the real thing. But the overall exe­cution of the dish was flawed. The dumplings arrived lukewarm, and the shallow pool of cold dashi didn't help — I wish the dashi had been served warm instead. Next was a light, palate-cleansing course of diced pineapple served inside half a guava with sea beans, a black sesame wafer, and a chili-yuzu vinaigrette. The paper-thin black sesame wafer was outstanding: sweet, toasty, and crisp. It would have been a delicious dessert, but didn't quite make sense when paired with the salty sea beans and tart vinaigrette. A course of baby octopus with chicharrón, passion fruit cream, coconut pearls, octopus jus, and a dusting of leek ash also suffered from problems of execution. There was a lot of brown on the plate, which I thought detracted from the presentation. I missed out on what was supposed to be a strong thematic tie — though it's not written on the menu, the chefs refer to this as their "dead reef" course, which they created to draw attention to the dying coral reefs. But the theme wouldn't have saved the dish. I enjoyed individual components like the warm chicharrón, coconut pearls, and leek ash. And while the baby octopus may have been a good choice from a visual standpoint, it lacked the crisp crust and succulent interior of full-sized octopus tentacles. It didn't help that the octopus was served lukewarm. The octopus jus was too salty and clashed with the dessert-like passionfruit cream. The next course of wild boar belly, however, was excellent. It was braised overnight with the leftover skins of pineapple, jackfruit, and guava in a move to minimize food waste and add flavor and tenderness to the meat. The boar belly had just the right amount of fat, and the jackfruit kimchi offered a unique, island-style twist that fit in perfectly. The carrot on top was poached in mango nectar for a hint of tropical flavor. The subtly sweet plantain cream helped tie everything together. The final savory course was goat with kabocha squash curry, pigeon peas, grilled lettuce, and a whole Thai chili. The goat, sourced from a farm in Davis, was juicy and wonderfully fragrant thanks to a spice rub of brown sugar, black garlic salt, chilis, and long pepper in which the goat was cured for an entire week. The sweet-spicy Thai-inspired kabocha curry paired surprisingly well with the Caribbean-inspired goat and pigeon peas, which also were cooked in goat stock to utilize every part of the goat — a win-win for sustainability and flavor. 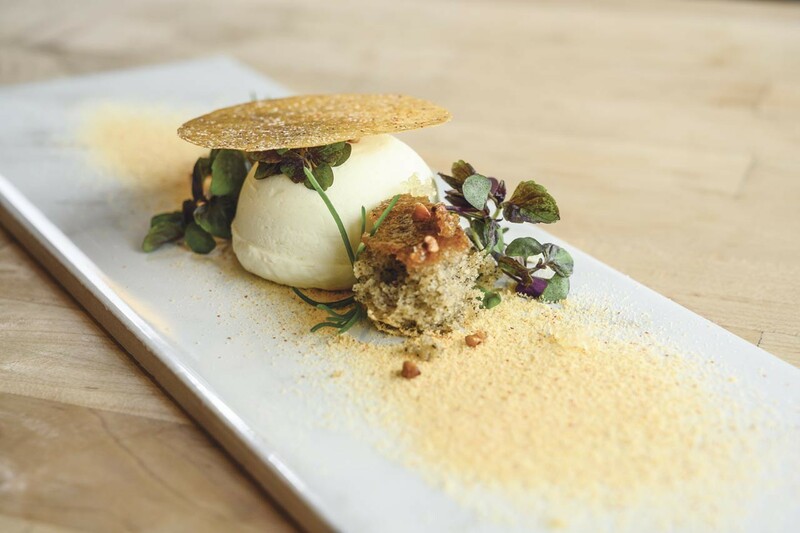 The meal ended with a dessert of Hawaiian cinnamon buckwheat cake with white chocolate-lime mousse, topped with a white chocolate-sesame-chile tuile, finger lime, and chili-sesame "sand." This dish hit all the marks. The Hawaiian cinnamon, sourced from Oahu, offered a brightness and warmth you'd never find in your average grocery store cinnamon. The mousse balanced the creamy, rich flavors of white chocolate with a hint of acidity from the lime. Touches like the delicately caramelized, crisp tuile, the subtle pop from the finger lime, and the slight crunch of the toasty sesame "sand" added dimensions of texture and flavor. The "sand" also drove home the concept of islands — a concept that remained strong throughout the meal, despite flawed execution in the earlier courses that improved as the dinner drew to a close.